Advocates Say Mayor Stoney's Education Compact is Code for Privatization in Schools | News and Features | Style Weekly - Richmond, VA local news, arts, and events. Jackie Kruszewski Kenya Gibson’s daughter holds the microphone as Gibson speaks at a news conference at City Hall on June 7. Ten advocacy groups called for the delay of the mayor’s Education Compact. Few people in Richmond know what the mayor’s Education Compact is. And among those who follow city education policy closely — teachers and parents, education policy experts, former School Board members, and city councilors — many are suspicious of it. Why is the nine-page document, released as a draft in February, causing so much consternation? 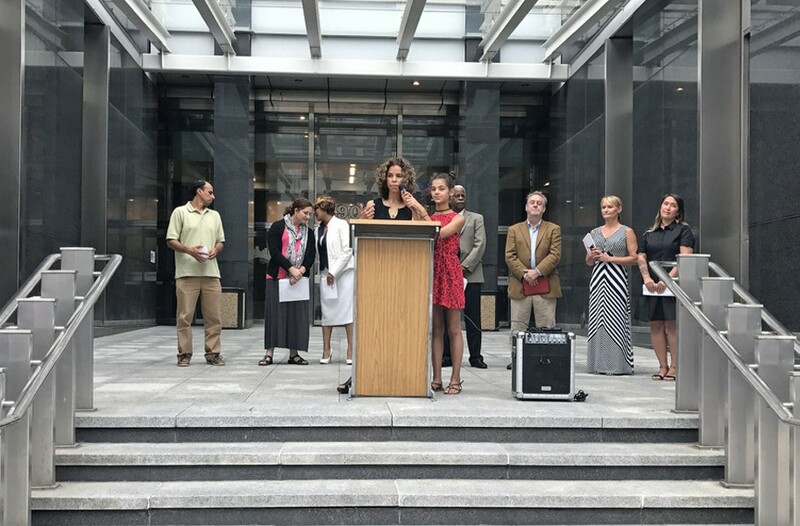 Nomi, representing Richmond Teachers for Social Justice, joined nine other education groups on the steps of City Hall last week calling for Mayor Levar Stoney, City Council and the School Board to delay the approval of the compact. They say hiring a new superintendent should take precedence over any strategic document, and that the new leader should have a say in creating one. Proponents of the compact, however, say it is merely a start: a declaration of the intent to collaborate on shared goals of funding and student achievement. And, they say, no good candidate for the position would want to apply without some such framework in place. “It is not about charter schools. It’s not about privatization,” said School Board member Nadine Marsh-Carter last week. None of those things is mentioned explicitly in the document itself, but opponents say they are reading between the lines. And recent events, such as the abrupt and unexplained firing of Superintendent Dana Bedden, have not added to assurances coming from elected representatives, they say. The privatization she and others worry about is the outsourcing of school services, such as cafeteria- or janitorial-related services, and student-learning strategies, such as testing remediation or enrichment programs. These things move public schools further from democratic control, she says. Thad Williamson, the mayor’s point person on the compact, said Bedden and his staff helped write the document, with councilors Cynthia Newbille and Michael Jones, School Board members Marsh-Carter and Liz Doerr, and mayoral staff members. Those four elected leaders would be part of a monthly-meeting education compact team, along with representatives from the philanthropic community, nonprofit partners, schools staff, parents, students and the business community. Those wary of the compact think the choice of two councilors and two School Board members was calculated. Holding a meeting with more than two elected representatives of one body triggers open government laws and requires certain notifications of their meetings. “I don’t know if it’s just logistical, but it feels intentional,” says Nomi. The people calling for a delay in the final compact — or in any resolutions from the council or School Board supporting it — also worry about the inclusion of business representatives. “That sounds a lot to me like privatizing and outsourcing,” she says. Williamson says the group would be treated as a public body and he expected a vetting process for conflicts of interest, but he stressed it was a fine line. “You can imagine situations where you’d want a stakeholder at the table, even though they wouldn’t be allowed to have business with the School Board,” he says. An update on the compact from the mayor’s office released last week seems to portend a scaled-back version of the draft that addresses some concerns. The update hones in on the institutionalized collaboration. It recommends quarterly joint meetings of the full City Council, School Board, and administrators. It calls for a children’s cabinet of various administrators whose departments affect children’s lives — in and outside of school. And it creates a team to “examine and make nonbinding recommendations on key issues, such as long-term funding of the operating and capital needs of schools,” according to an update released by the mayor’s office last week. But schools advocates are on high alert for anything resembling support for charter schools. Such schools, which receive public funding but have limited government oversight, often are touted as a way to experiment with educational strategies and offer choices to parents. These schools are difficult to create in Virginia, partly because elected school boards with little budgetary control have regulatory control over charters. Few boards want to outsource the control they do have. Gov. Terry McAuliffe vetoed a Republican-backed bill to loosen those restrictions this year. And if rhetoric surrounding the compact is any indication, the schools have no haven in Richmond. There’s just one now, the elementary Patrick Henry School of Science and Arts. Opponents say charter schools pull valuable resources from public schools, do not deliver on student achievement promises and exacerbate segregation. There are strains of national politics in the education groups’ fears. President Donald Trump’s education secretary Betsy DeVos is an advocate for privatization and charter schools, and there is fear that her influence already has trickled down. Williamson says charter schools were “zero part” of the conversation or thought process on the compact — and that he would not entertain them. The Colorado city was cited early in compact presentations as a model for Richmond’s proposal. Williamson says the elected officials and administrators are forging ahead with a final version that will go to City Council and the School Board for approval. They wanted compact meetings to be well established before the next budget season. Concern for the environment into which the new superintendent will walk is one thing both sides can agree on. Kenya Gibson, a marketing strategist and vice president of Linwood Holton Elementary School’s PTA, urged unity and collaboration that wouldn’t trap the next superintendent.